Showing 34 articles from May 4, 2016. LOUISBURG -- A developer urged Franklin County leaders to prioritize improvements to a Youngsville pump station that, if left in its current state, could jeopardize a development that could grow the town by almost 40 percent. David Lazzo told county commissioners on Monday night that a 174 lot Wynn Homes development on 70-acres of Cross Street has been approved by Youngsville's Board of Adjustment. 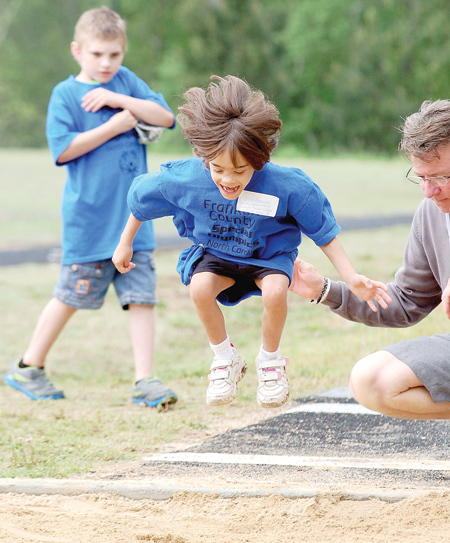 Little Ellia Brown shows off her long-jumping form recently at the Franklin County Special Olympics held at Franklinton High School. LOUISBURG -- Ed "Service" Wilson. It wasn't the name he was born with. And it wasn't quite the name stamped into his dog tags during 20 years in the Army, including two stints in Vietnam. 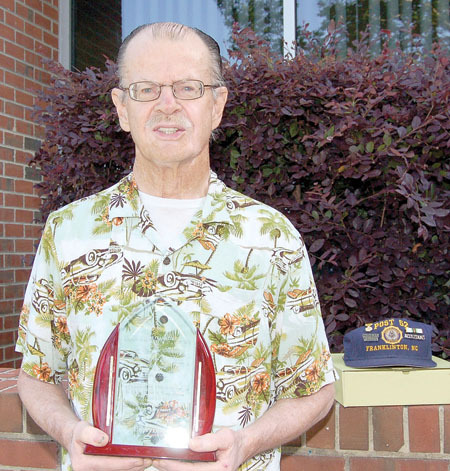 But it's the middle name he's earned over several decades of his life, the most recent as part of the Four Amigos -- a group that has been building handicap ramps for those in need on behalf of United Way. HELPING HAND. 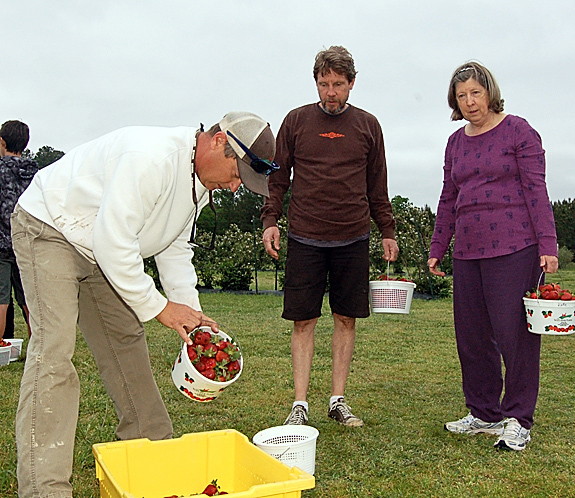 Russ Vollmer, left, places strawberries in a donation bin. John Provetero, center, and Kady McDonald from Garner picked berries for themselves and made donations. FRANKLIN COUNTY -- A wind and hail storm swept through south central Franklin County last week, crippling two farms in its destructive path. Robert Richards of Triple R Farms on Bob Richards Road watched helplessly as winds topping 100 mph lifted a shelter off the foundation and sent it flying -- leaving behind a debris field of metal and beams in the tons. A tree also fell onto a migrant house and the roof on a migrant trailer was damaged. WASHINGTON -- Attorneys expect to appeal a ruling that upheld a state law requiring voters to show photo ID. 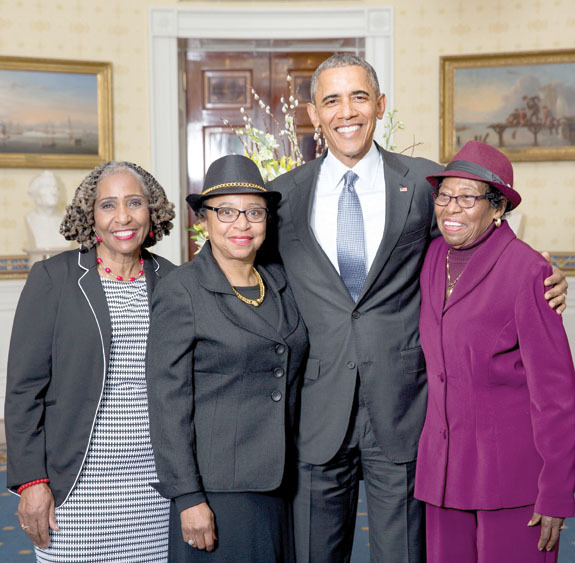 The lead plaintiff in that lawsuit, Franklin County native Rosanell Eaton, has been called historic and President Barack Obama helped solidify that by inviting her to attend a Women's History Month Reception in March. Eaton, 94, raised in the Jim Crow South, overcame a literacy test over 70 years ago when she first attempted to register to vote. What a great weekend -- and that's not a reference to the weather. 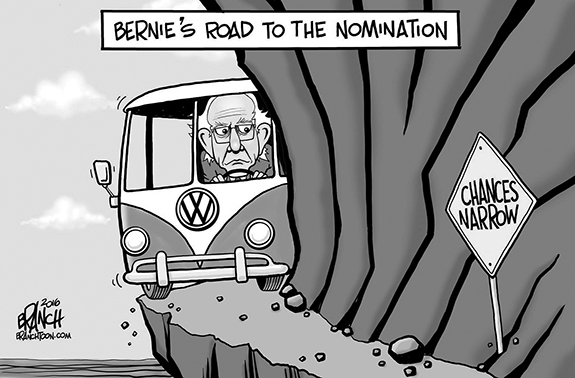 It was a weekend full of free, fun, often hilarious entertainment -- and the Democrats are going to have to kick up their game several notches if they hope to compete with the reality show that has become Republican politics this year. 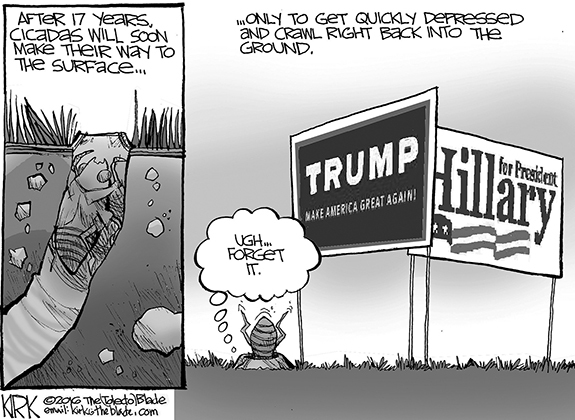 Whether it's at the national level with The Donald and a cast of wannabes or at the state level with Poor Pat and a General Assembly led by the Keystone Kops shooting themselves in the political foot, they have pushed politics to new levels of hilarity. The long-running saga that is Franklin County's effort to get a radio system that actually works would be funny -- IF it weren't so expensive and IF lives of our first responders weren't being put in danger by an inadequate radio system. The price tag is huge -- more than $11 million that officials admit and that's probably not a full tally. To put that in perspective, that is the cost of a new elementary school, with playground and athletic facilities. If spanking kids is wrong, do we wanna be right? It's hard to debate cold, hard facts and statistics. Five decades of research were recently released in a study and its authors concluded: Spanking has many negative outcomes. According to reports, after analyzing all the data, spanking has long-term harmful effects on kids. During the last few weeks, we have not only seen signs of North Carolina becoming a pariah state within the global business community but now within the Republican Party itself. New Mexico Gov. Susana Martinez's office made a Friday afternoon announcement that she was backing out of a previous long-standing commitment to be the keynote speaker at the North Carolina Republican Convention on May 7 in Greensboro. FRANKLINTON--Frank Edwards, 65, a resident of 416 S. Chavis Street, Franklinton, died Monday, May 2, 2016 at his home. LOUISBURG - Toki Davis, 91, died Monday, May 2, 2016 at Franklin Oaks Nursing and Rehab Center in Louisburg. Funeral services will be held at 2 p.m. Saturday, May 7, at South Main Street Baptist Church, Louisburg. PROLIFIC IN THE PAINT. 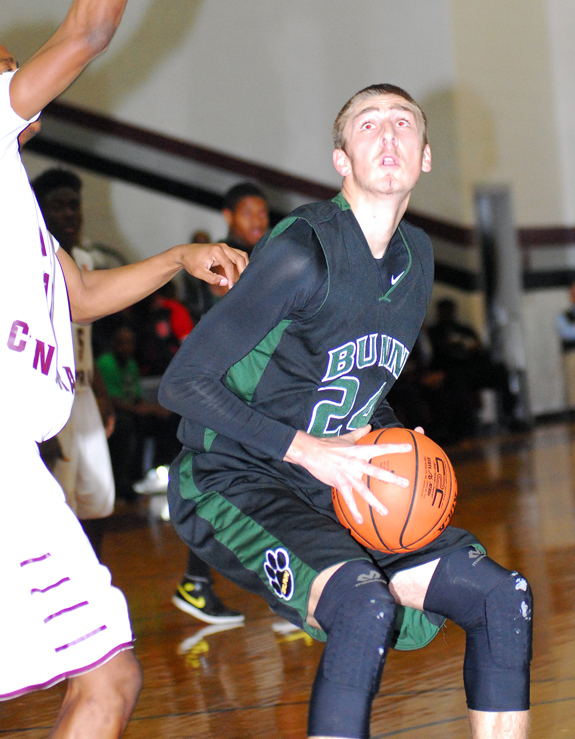 Shane Garrison was an outstanding performer for the Bunn High School boys basketball program -- and was an inside force for the Wildcats. BUNN -- Montrel Cooke, Clay Thorne, Michael Collins, Jaymes Kingsberry. Even though Sandhills Community College's men's basketball history is less than one decade old, the list of Bunn Wildcats who have signed to play at SCC is abundant -- and still growing. THE SURE SHOT. 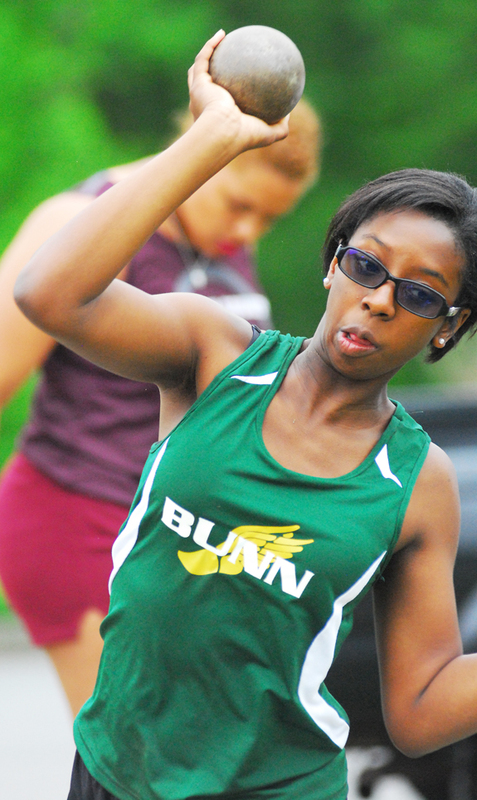 Bunn's Jasmine Akoto sends a heave forward during the Girls Shot Put event. And once again, the Franklinton Red Rams found sunny days atop the NCC standings after the annual league championships, which were held Tuesday under threatening conditions -- at least early on -- at the FHS Football Field. Franklinton won the boys team crown for the third straight time by lapping the field with a whopping 226.50 points. 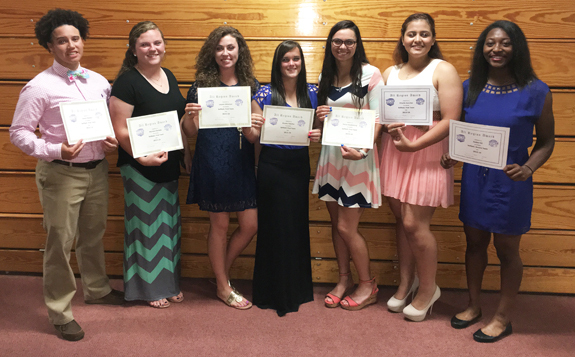 NCC HONOREES. Bunn High School golfers Troy Bennett (l) and Presley Johnson (r) earned spots on the All-Northern Carolina Conference Team. They are pictured with Coach John Dietz. ARAPAHOE -- Louisburg High School will have two qualifiers at the annual Class 1-A State Boys Golf Championships -- including Reed Wheless' third consecutive trip. 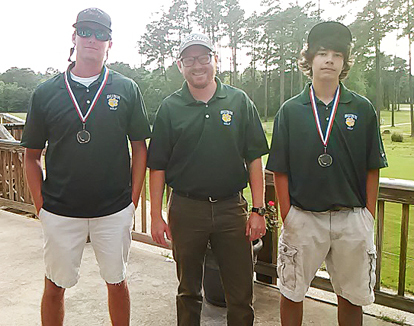 Wheless and Christian Rowe will represent the Warriors after picking up at-large berths at the East Regionals, which were held Monday at Minesott Country Club near the coast. LOUISBURG -- First-year head coach Blake Herring hopes his Louisburg College Hurricanes have saved the best for last during the 2016 baseball season. The Hurricanes, who struggled through the regular season portion of the campaign, will be seeded seventh for the upcoming Region X Tournament, which will be held beginning Saturday at historic Grainger Stadium in Kinston. The winner of the double-elimination format will reach the districts with a chance to qualify for the NJCAA World Series in Grand Junction, Colorado. HICKORY -- The annual South Atlantic Conference Track and Field Championships had quite a Franklin County flair -- and even rekindled an old prep rivalry between Franklinton's Charity Snelling and Louisburg's Vanisha Wilshire. 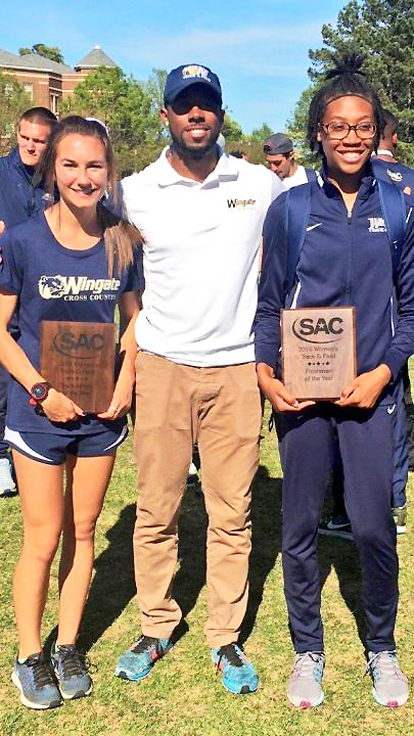 Wilshire, a freshman at Wingate University, outdueled Snelling to win the SAC Women's High Jump title with an effort of 5-05.75. Snelling, now at Coker University, tied that number, but was second on scratches. ZEBULON -- Keith Curcio hit a two-run home run in the third, Matt Withrow allowed a run and four hits in a career best six inning start and Joey Meneses stretched his hitting streak to seven straight games as the Carolina Mudcats clinched a Class A Carolina League baseball series victory with a 5-4 home win against the Hillcats on Sunday afternoon at Five County Stadium. Withrow (W, 1-1, 1.04) picked up his first win of the season while working through his longest career start. Former Louisburg High School standout Vanisha Wilshire (right) was recently honored as the Freshman of the Year for Girls Track and Field at the annual South Atlantic Conference Freshman of the Year. The event was held in Hickory. Wilshire is a freshman at Wingate University near Charlotte. 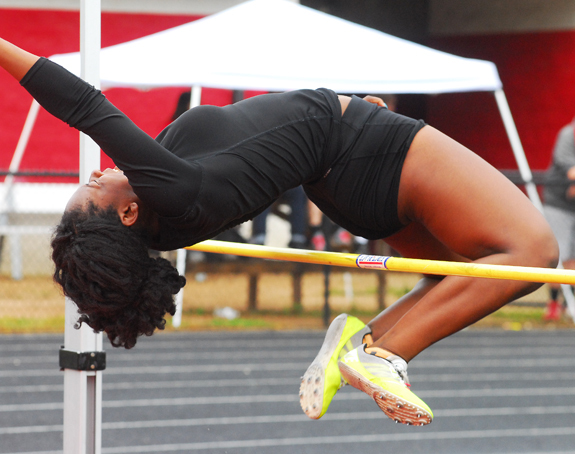 Franklinton's Kaylaa' Holman competes in the Girls High Jump -- and clears the bar -- during Tuesday's action at the Northern Carolina Conference Track and Field Championships at the Franklinton High School Football Field. 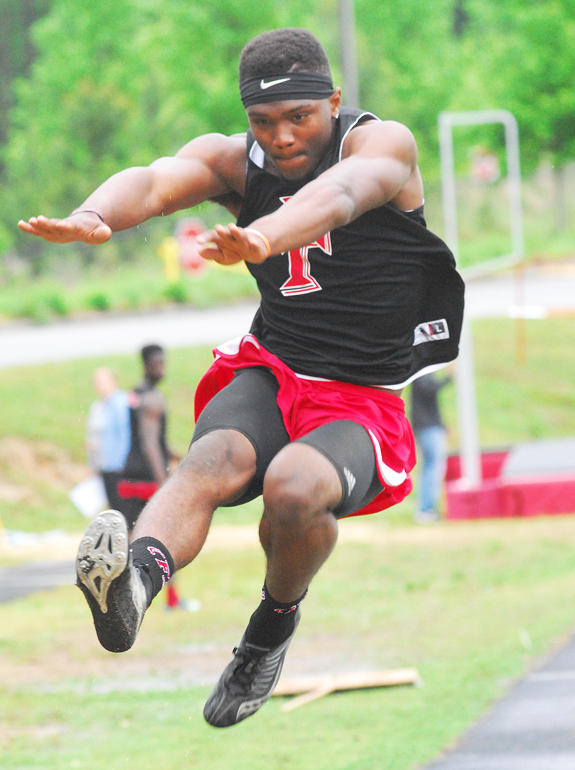 Franklinton's Ricky Person elevates in the Boys High Jump as part of Tuesday's action at the Northern Carolina Conference Track and Field Championships. 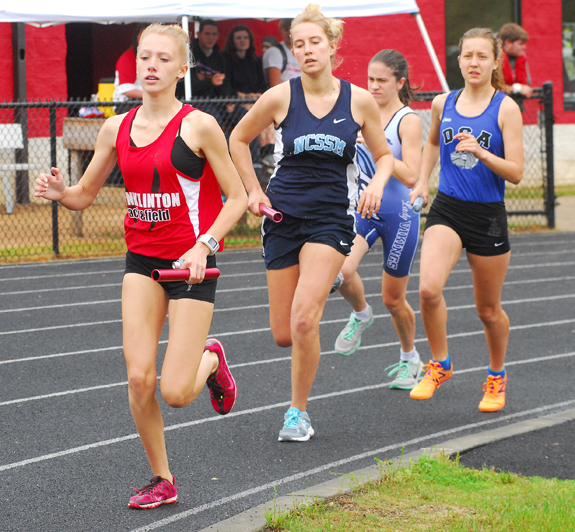 Franklinton's Robyn Hamilton takes the field during her leg as part of the Girls 3200 Relay at the annual Northern Carolina Conference Track and Field Championships, which were held Tuesday at the Franklinton High School Football Field. 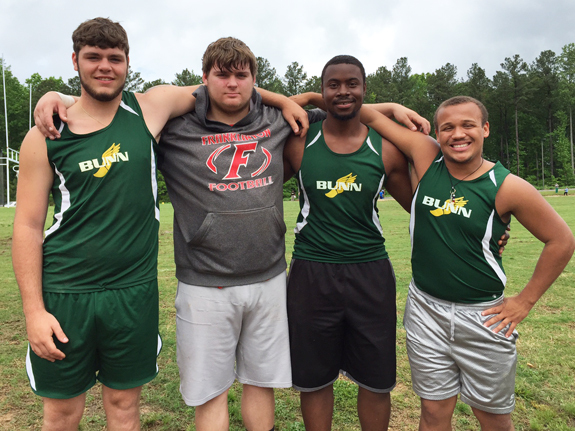 Once again, Franklin County was well-represented in the boys shot put competition at the Northern Carolina Conference Track and Field Championships, which were staged Tuesday on the campus of Franklinton High School. Pictured are (l to r) Jackson Leggett (Bunn), Jason Hurley (Franklinton), Deshon Moore (Bunn) and Adam Black (Bunn). Franklinton will also host the Class 2- A Mideast Regionals next Friday beginning at noon. 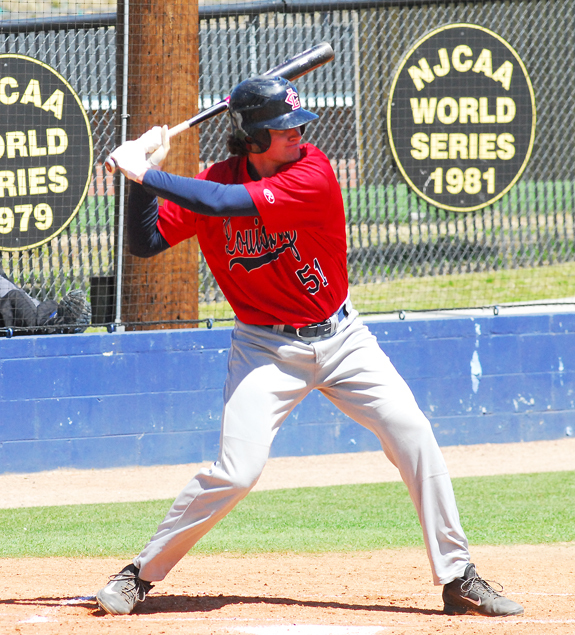 Matthew Herzog and the Louisburg College Hurricanes will be in action beginning this weekend at the Region X Baseball Tournament at Grainger Stadium in Kinston. The Northeast Piedmont Chorale is planning two free public concerts in May entitled "Kaleidoscope of Voices." The first will be at 7 p.m. Saturday at the Renaissance Funeral Home, 2615 Six Forks Road, Raleigh and the second will be at 7 p.m. Sunday, May 15, at Covenant Presbyterian Church, 125 Selma Road, Wendell. For directions, visit the group's website, www.npchorale.org. 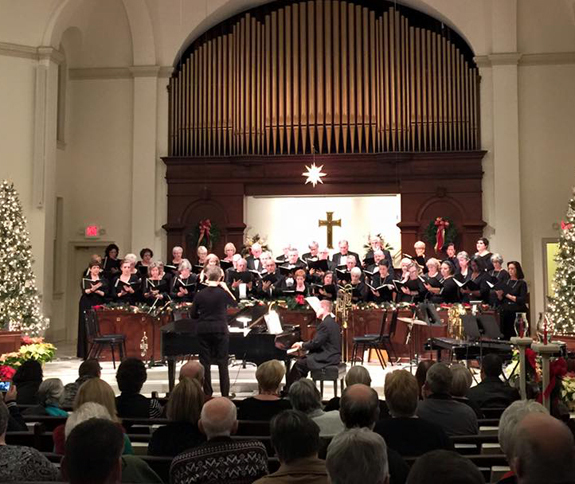 With more than 40 singers, the Chorale is a non-profit, non-sectarian, volunteer organization under the direction of Conductor Sue Crocker of Wake Forest. Organist Alan Davis of Louisburg accompanies the Chorale. HENDERSON -- Vance-Granville Community College recognized 55 students who were inducted into Phi Theta Kappa, the international honor society for students of two-year colleges. The event was held April 19 in the Civic Center on the college's Main Campus. 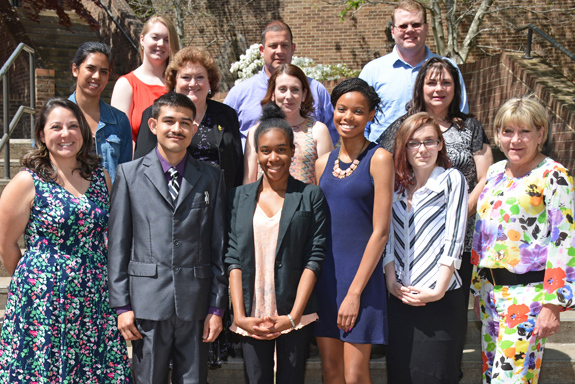 VGCC students honored with induction into Phi Theta Kappa must have a cumulative grade-point average of at least 3.5 (3.75 for part-time students) in associate degree curriculum programs and have completed at least 12 credit hours toward their degrees. 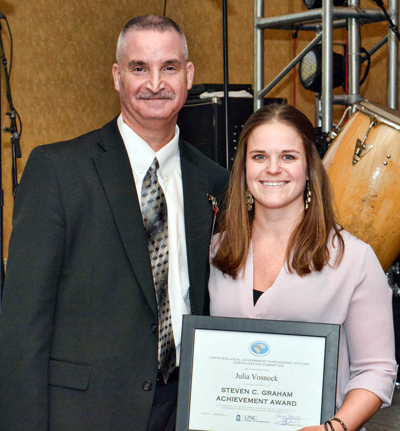 HENDERSON -- A new award has been named in honor of Vance-Granville Community College Vice President of Finance and Operations Steven Graham by the Carolinas Association of Governmental Purchasing. The association has established an award for outstanding candidates seeking to become Certified Local Government Purchasing Officers, and has named it the "Steven C. Graham Achievement Award" in recognition of Graham's commitment to developing government purchasing professionals. 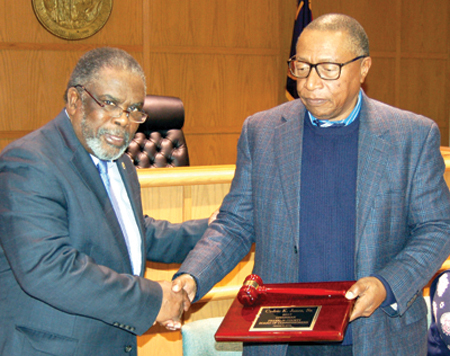 He was instrumental in developing a training program for purchasing officers with the UNC School of Government. LOUISBURG -- Authorities arrested four teenagers in the past week, charging them with a series of break-ins. Patrol and investigative deputies charged Jose Manuel Perez, 16, of Louisburg, Cristian Perez, 18, of Louisburg, Erik H. Cortez, 17, of Spring Hope and Alejandro Benitez, 16, of Middlesex, with seven counts of felony breaking and entering and seven counts of felony larceny. According to authorities, the group broke into a number of homes, including properties in the Castalia area of the county around April 19. LOUISBURG -- Franklin County narcotics deputies teamed with Alcohol Law Enforcement agents to arrest a store employee accused of selling drugs at the store. According to authorities, deputies and ALE agents executed a search warrant at Five Star Grocery in the 3500 block of N.C. 39 N on April 27 and arrested Shalonda Harris, 37, charging her with four counts of trafficking, felony possession of cocaine, possession with intent to sell and deliver cocaine, possession with intent to sell and deliver marijuana, maintaining a vehicle for the sale of a controlled substance, possession of marijuana paraphernalia and simple possession. A service award that's unique to Franklin County will honor the memory of two local women who made a difference in the community. The Elizabeth May Service Award has been created in the name of a woman who unselfishly served the community for many years in a variety of capacities. The award is being created by a foundation that honors the memory of another local woman, Kay Foy (Culbertson) Robertson, who died June 6, 2011, the result of an equestrian accident. A Louisburg man was killed over the weekend in a single-vehicle wreck. According to the State Highway Patrol, Zackary Shearin was driving a pickup truck on Pearces Road the evening of April 30 when he ran off the road. The truck struck a tree and the passenger, Douglas C. Fowler, 27, was killed. Shearin, of Spring Hope, was charged with driving while impaired and felony death by motor vehicle. 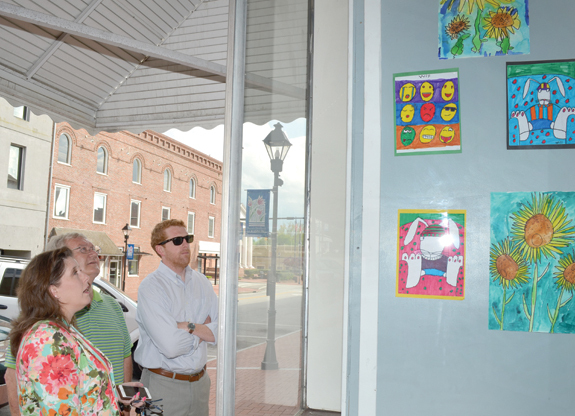 Some of downtown Louisburg's buildings have gotten into less-than-ideal condition over the past several years, but new Town Manager Jonathan Franklin (at right) came up with the idea to lease some of the store windows and use them to display local art. The windows here are in a former computer store at 111 North Main Street and the first student artwork went on display this week, courtesy of art instructor Tammy Raynor Petrosillo (left) after town crews created the display panels under the supervision of Utilities Director Ray Patterson (center).